I know I’ve mentioned to you my affinity for the line of all natural lip colors made by Burt’s Bees – from their barely-there, super moisturizing tinted lip balms, to their richly pigmented lip glosses – on quite a few occasions, however, I don’t think I’ve shared with you the other component that makes the brand so over-the-top special to me. It’s the fantastic employees, and those who run the company, whose love for what they do, that is so contagious and inspiring. Since we started working together nearly 2 years ago, I’ve really valued my visits to their headquarters in North Carolina. 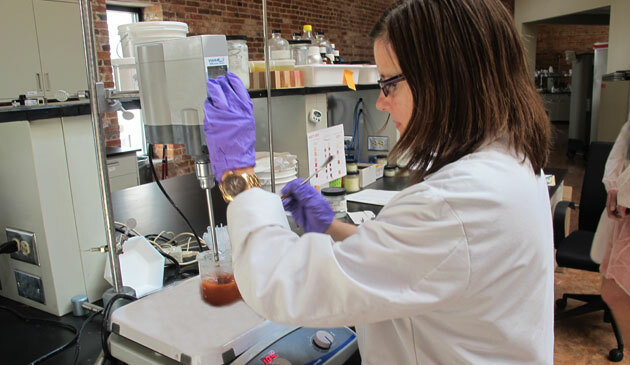 The offices – which include their in-house lab- sit on a beautiful campus, and are staffed with forward-thinking, eco and health conscious, all around nice people, each of whom work extra hard towards the common goal of making Burt’s Bees the best brand it can possibly be. They’re the kind of company you’d expect: with recycling stations on each floor so that ‘throwing something away’ is a thoughtful practice, with lovely, open, communal areas in which to meet, a large skylight over the cubicle areas, complete with ergonomically correct chairs and/or yoga ball seats, which are great for the spine, and for keeping stomach and leg muscles engaged. They also host community volunteer days – building houses, cleaning up neighborhoods – that kind of wonderful stuff we all should be doing. 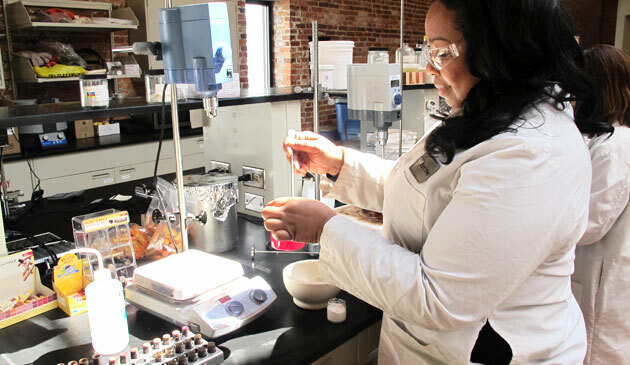 On top of all of that, one additional, very unique feature that sets this personal care/beauty product company apart from most others is this: their open-air laboratory, in which in-house chemists create, develop, and test new products, and seasonally work with staff to update, add to, and tweak the range of lip colors. With no toxic fumes from scary chemicals to pollute the air, the chemists are free to tinker and mix and cook to their hearts’ content, with no worry of noxious chemicals invading their coworkers’ noses or eyes. I met with two lovely chemists, Cheryl Hilll and Abena Antwi, who invited me into their workspace to become intimately acquainted with the process of creating a tube of Burt’s Bees Tinted Lip Balm. They even let me experiment with pigments, and create a shade of my very own. Witnessing the mysterious back-end of product development has meant so much to me. Seeing the beakers and saucers filled with the raw ingredients that, when blended together just right, result in the perfect tube of what I press into my lips, and into the lips of my clients, has made me feel even more certain of my decision to ‘go green’. I love that I can share a glimpse of my experience with you, here. Below are some shots I took while in the lab on my most recent trip. Is it what you’d expected the lab to look like? 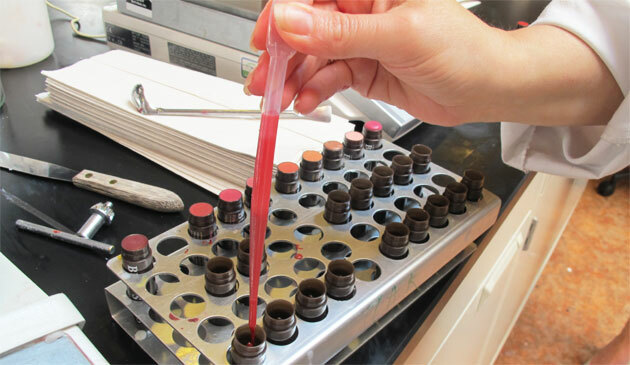 One last thing I’m excited to share with you: I helped pick the shades for an upcoming launch of lip color. 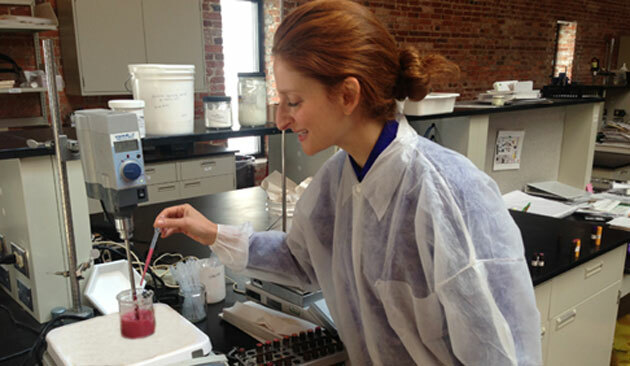 Eve Fusco, the Product Development Manager at Burt’s Bees so generously welcomed me into the mix and taught me how it’s done. It’ll be a while before these new products hit the shelves, but oh boy, was it fun to be a part of the process. I’ll keep you posted.